Posterior reduction and fusion of spondylolisthesis has a number of recognized and accepted procedural difficulties dependent on its severity. The Jazz™ Band is a novel system designed primarily for posterior fixation of the spine; however, its uses can be applied to a breadth of spinal conditions. Its benefits include that one size will fit all spinal levels; the connector is designed for multiple union rod diameters and reduced comorbidity when compared with other surgical methods. 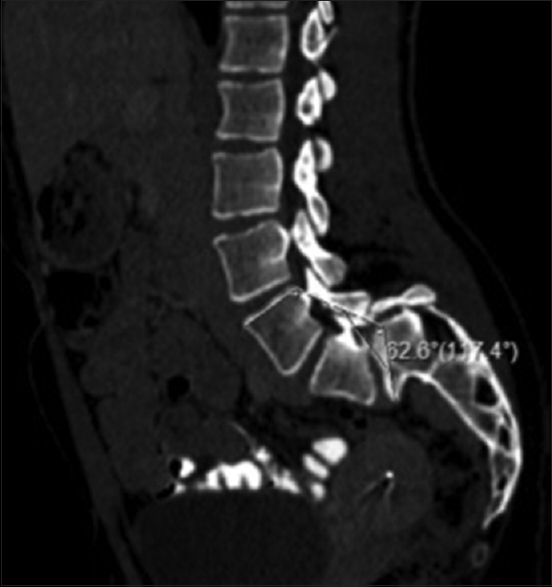 We present a case of a 26-year-old female with an L5/S1 spondylolisthesis slip angle of 117.4°. A 25° improvement in the spondylolisthesis slip angle was achieved with the use of the Jazz™ Band. The Jazz™ Band demonstrates excellent short-term results, and in order to determine the clinical outcomes and efficacy of the Jazz™ Band system, long-term results and analysis should be performed. 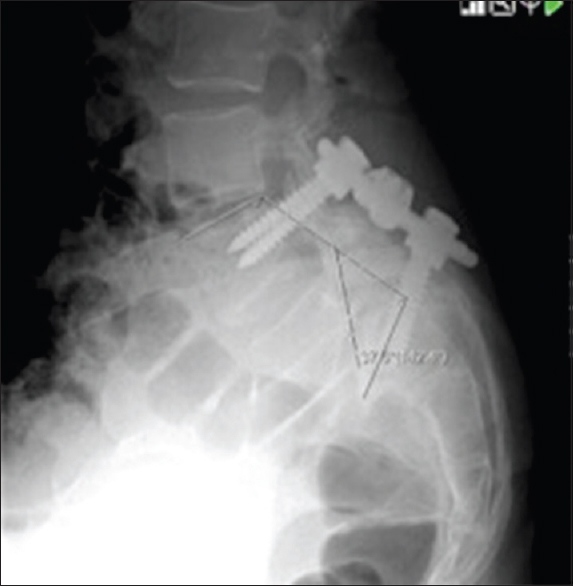 Posterior reduction and fusion of spondylolisthesis has a number of recognized and accepted procedural difficulties, including crowding of screws, difficulty inserting L5 pedicle screws related to the severity of spondylolisthesis, and screw pullout. A recent systematic review comparing reduction and arthrodesis versus arthrodesis in situ concluded that a potential improvement in biomechanics could be achieved by reducing vertebral slippage. Further conclusions included that reduction was not associated with a greater risk of neurologic deficit. This system, produced by Implanet, is a novel system, designed primarily for posterior fixation of the spine [Figure 1]. Indications for use include degenerative spinal surgery to supplement vertebral fusion, spinal deformity surgery, and traumatic fracture surgery. It may also be used in conjunction with other implants to help secure the fixation. The Jazz™ Band consists of a titanium alloy connector and screw, a polyester terephthalate braid, and a stainless steel buckle and metal strip. 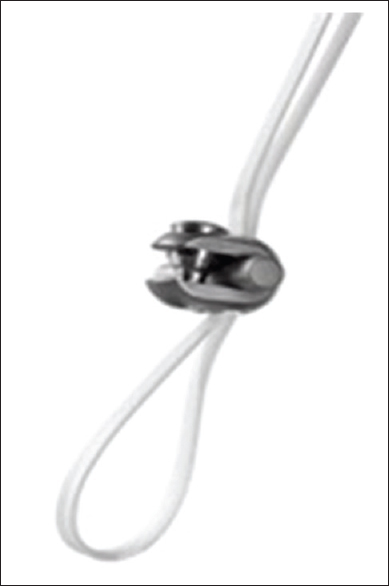 The benefits of this fixation and reduction device include that the one available size fits all levels, its connector is designed for multiple union rod diameters, there are reduced comorbidity and bleeding compared to pedicle screws, and the operative technique is less hazardous than pedicle screw fixation. A research has also demonstrated that there is no increased risk of surgical site infection with the use of polyester bands, when compared with conventional surgical methods. The Jazz™ Band has been shown to offer an alternative to other sublaminar implants for hybrid constructs with evidence of reduced operative time, reduced blood loss, low morbidity, and equivocal radiological outcomes,,,, and imperatively be as equally safe from a neurological point of view when compared with other surgical methods. A 26-year-old female was referred with a 10-year history of back pain. She had started to develop sensory changes down her right leg. On assessment in clinic, there was hyperlordosis with obvious pelvic tilt and limited flexion. Magnetic resonance imaging carried out prereferral demonstrated spondylolisthesis of L5-S1 with resultant bilateral foraminal stenosis with compression of both L5 nerve roots and severe central stenosis. Surgical options were discussed with the patient however they opted for conservative management. The patient again presented 1 year after the initial review complaining of ongoing and increasing pain and wanted to explore surgical options. The patient decided to proceed with surgical fixation, which included surgical reduction and instrumented fusion L5/S1. A preoperative computed tomography scan can be seen in [Figure 2]. Surgical reduction was performed using the Jazz™ system with sublaminar fixation of L5. Screws were placed into L4 and S1 as normal, and the Jazz™ system was attached to the rods and used to aid reduction of L5. A postoperative radiograph is seen in [Figure 3] showing a 25° improvement. At an early postoperative review, the patient's pain and sensory symptoms had improved. We have demonstrated that the Jazz™ Band has been successfully used in our local practice with excellent short-term results. The Jazz™ Band system avoids the difficulty of screw crowding and reduces the risk of potential screw cutout, particularly in osteoporotic patients. In order to determine the clinical outcomes and efficacy of the Jazz™ Band system, long-term results and analysis should be performed. Longo UG, Loppini M, Romeo G, Maffulli N, Denaro V. Evidence-based surgical management of spondylolisthesis: Reduction or arthrodesis in situ. J Bone Joint Surg Am 2014;96:53-8. Available from: http://www.implanet.com/en/product/haka-plif-2/. [Last accessed on 2018 Feb 02]. Issa SP, Angelliaume A, Vidal C, Mazda K, Ilharreborde B. Do sublaminar polyester bands affect the outcomes of postoperative infections after adolescent idiopathic scoliosis surgery? J Pediatr Orthop 2017;37:e524-9. Ilharreborde B. Comparison of Two Polyester Sublaminar Bands for the Treatment of Thoracic Adolescent Idiopathic Scoliosis with CoCr Rods: Jazz Band Versus Universal Clamp. White Paper, Implanet; 2015. Available form: https://www.implanet.com/wp-content/uploads/2015/04. [Last accessed on 2018 Feb 02]. Desai SK, Sayama C, Vener D, Brayton A, Briceño V, Luerssen TG, et al. The feasibility and safety of using sublaminar polyester bands in hybrid spinal constructs in children and transitional adults for neuromuscular scoliosis. J Neurosurg Pediatr 2015;15:328-37. Cavagna R, Goasguen O. Hybrid Screw/Jazz Constructs in Degenertive Lumbar Scoliosis Surgery: Preliminary Results. White Paper, Implanet; 2014. Available from: https://www.implanet.com/wp-content/uploads/2015/04. [Last accessed on 2018 Feb 02]. Gazzeri R, Faiola A, Galarza M, Tamorri M. Universal clamp system in thoracolumbar spinal fixation: Technical note. Acta Neurochir (Wien) 2009;151:1673-80. Unterweger MT, Kandziora F, Schnake KJ. Hybrid stabilization of thoracic spine fractures with sublaminar bands and transpedicular screws: Description of a surgical alternative and review of the literature. Case Rep Orthop 2015;2015:857607. Polirsztok E, Gavaret M, Gsell T, Suprano I, Choufani E, Bollini G, et al. Sublaminar bands: Are they safe? Eur Spine J 2015;24:1441-9.